Police Militarization in the US: Does It Really Help? The SWAT team was initially established to handle life-threatening situations and violent civil unrest. Today, however, the American police have started utilizing SWAT tactics. This is what people mean when they refer to the U.S. police becoming militarized. In addition, the SWAT teams are now being called in for minor situations in which they actually aren’t needed. Below we will take a closer look at militarization of the police in the U.S. and whether it really helps. Why Is the American Police so Militarized? The Los Angeles and Philadelphia police departments were among the first to develop the concept of SWAT teams. Big cities across the U.S. quickly adapted the new concept to combat high crime areas. Additional reasons the American police have militarized are 9/11 and fear of crime. Police militarization in the U.S. started in the 1960s when the SWAT team was created. It wasn’t necessarily a bad thing. The SWAT team was needed to stop riots, senseless violence, and other dangerous disturbances. Militarization of the police becomes a concern when excessive force is used in situations in which it isn’t warranted. An example of a mass murder case from the 60s that contributed to police militarization in the U.S. is the Clocktower murder in Austin, Texas. Charles Whitman killed his wife and his mother, then sniped 14 other people from his university’s clocktower. 31 people were wounded. For tragedies like this, having a SWAT team available to call in is a good thing. According to professor Peter Kraska, the U.S. deployed SWAT teams 3,000 times in 1980. By 2014, SWAT teams were deployed around 50,000 times. Baltimore, Dallas, and New Haven are examples of cities with police militarization. In 2010, New Haven deployed a SWAT team at a bar suspected of serving people who are under age. As already explained, many big cities started SWAT teams to deal with high crime areas. However, some small towns developed SWAT teams too. Radley Balko cited in Rise of the Warrior Cop that 26% of towns with just 25,000-50,000 people had SWAT teams in 1984. 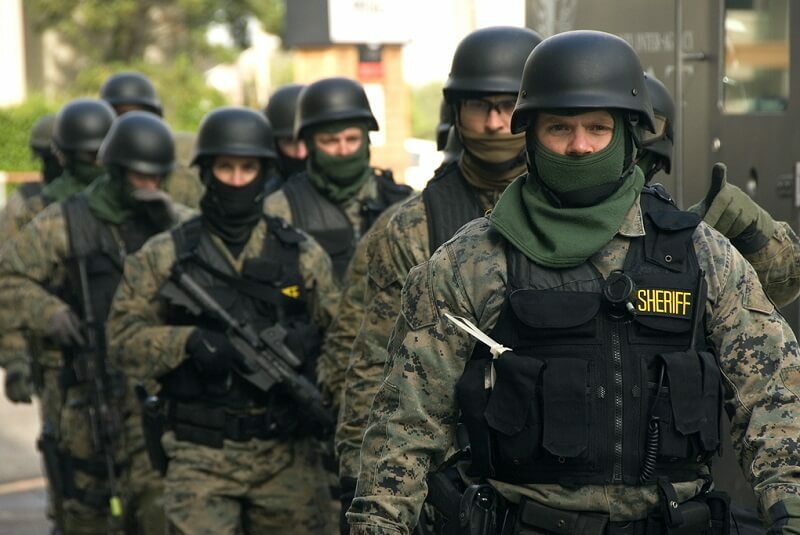 By 2005, 80% of towns with a population of 25,000-50,000 had SWAT teams. Kraska estimates that 50,000 SWAT raids occur in the United States every year. And the ACLU (American Civil Liberties Union) reported in War Comes Home report that 80% of the SWAT raids in 2011-2012 were initiated to serve a search warrant. Many people can agree that calling in the SWAT team for a search warrant is excessive. The Police Can Effectively Handle Dangerous Situations. Military-grade equipment is sometimes necessary to quickly regain control over a dangerous situation. Riots and mass murders are examples of such scenarios. When police have access to better quality weapons, they become more effective at handling dangerous situations. Military-Grade Vehicles Can Minimize Gunfire. Although the military-grade vehicles look intimidating, they can minimize gunfire. Police officers are safer in those vehicles than the standard police car. Because they’re safer, they won’t have to exchange fire with criminals, resulting in saved lives on both sides. Had we not had the ability to protect officers with those vehicles, I am afraid that we would have to engage people with our own gun fire. I really think having the armor gave us the ability not to have pulled one trigger… I think the military uses armor to be able to provide an offensive force, and police departments use trucks like that so they don’t have to. Using the Military Mindset on Citizens Is Dangerous. One of the biggest cons of militarization of the police force is how dangerous using the military mindset on civilians is. The military views the opposition as an enemy that must be eliminated. Citizens, however, are people with rights protected by the United States constitution. They are not an enemy. Standards for Police Are Low. Another problem with militarization of the police is benchmarks to become a police officer are low. If a person is going to be handling military-grade equipment, they should be responsible and in control of their emotions. Some police officers abuse their power and aren’t truly fit to have that kind of position. Prevents a Good Relationship with Citizens. The police force is supposed to have a good relationship with the community. They are to protect and serve citizens within their communities. Citizens naturally become wary of the police when they are militarized, especially when that militarization is being abused by some. There are too many stories of citizens being traumatized by the SWAT team busting down their doors without warning or just cause. Many people who get arrested are good people who have made mistakes, were wrongfully arrested, or were guilty by association. Police officers sometimes use excessive force as a result of a military mindset. For these reasons, caution should be used when militarizing the police. 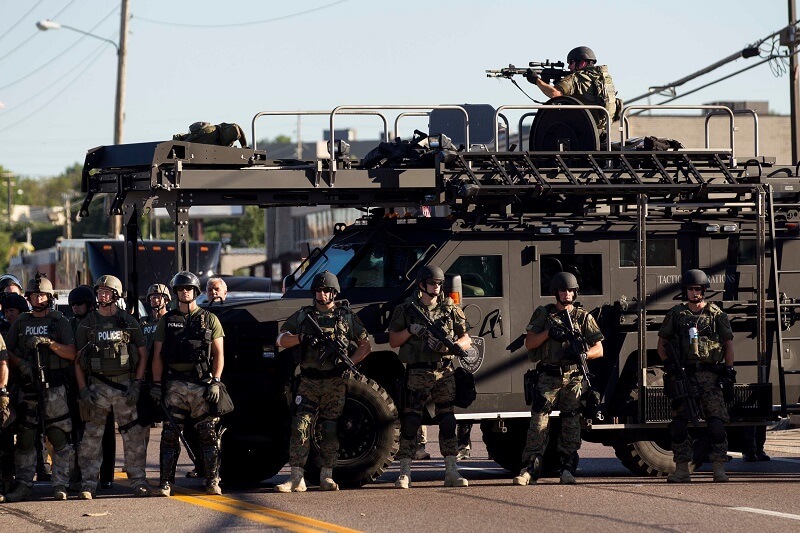 However, with the amount and type of crime in the United States, some level of police militarization is necessary. Hey Buddy!, I found this information for you: "Police Militarization in the US: Does It Really Help?". Here is the website link: https://thegunrights.com/police-militarization-in-the-us/. Thank you.